Dutch classic Super Silver Haze is a Haze that is still very popular among growers and smokers. For some, SSH simply means a Haze of the highest quality with outright extraordinary genetics. It really is no surprise, given that her lineage includes three of the very best cannabis strains: Skunk, Northern Lights and Haze. It’s her fabulous genetics that makes SSH an extraordinarily productive sativa with yields of up to 700g/m² when grown indoors under a 600W light, in a rather short 65 days of flowering for a Haze. Yet another advantage of growing Super Silver Haze is her compact stature that won’t likely exceed 80-110cm indoors, making her a very manageable plant to grow. Grown outdoors, she can get a lot taller, reaching heights of up to 230cm and yielding up to 650g per plant in ideal conditions. When she grows, Super Silver Haze will sparkle with a myriad of white crystals, she’s an incredibly beautiful strain to grow that will put a smile on your face just by looking at her! Super Silver Haze is the perfect daytime smoke. Thanks to 21% of THC she will deliver a very powerful, energising and uplifting high, that is unique and in a league that only a top Haze can give you. She’s a fantastic smoke that will lift your mood, boost creativity and give you an all-around happiness. You’ll likely not need more than a hit or two. Her flavour, which blends sweet notes with spicy tones and citrus aromas, is equally outstanding, rounding off an excellent smoke experience that explains why many think that nothing comes close to Hazes when it comes to top cannabis! Super Silver Haze by Zambeza delivers a genuine Haze smoking experience that doesn’t leave a doubt about the high quality of this strain. Her potency and great taste convince not only Haze lovers and the insane productivity makes her a top choice also for growers. 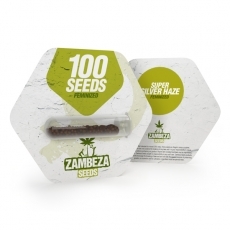 Zambeza offers Super Silver haze bulk seeds in packs of 100 seeds for all those who want to stock up on larger quantities of this outstanding Haze.